Finally – an alternative to traditional employment that everyone can use, simply and easily. Our vision: Everyone an Entrepreneur! 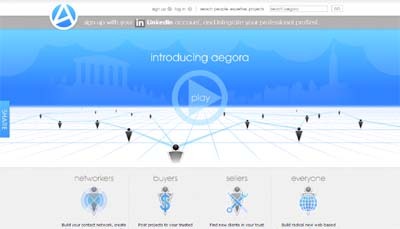 Aegora takes the professional network (for instance LinkedIn) and adds value by letting users monetize their trusted contact networks – buying and selling services. Aegora also takes the freelance marketplace (for instance oDesk or Elance) and solves its functional and image problems by letting users reach the right trusted person quickly and easily, through their contact network.